Big brook trout are my favorite fish, and Labrador is the best place to fish for them, where they can be taken on everything from nymphs and dries to mouse imitations and streamers. The brook trout is one of the most incredibly beautiful creatures in the water. Their sides have spots of blue, red, and yellow, and during the spawning run the males become bright red on their sides, with the fins becoming bright red with bands of white on the front. 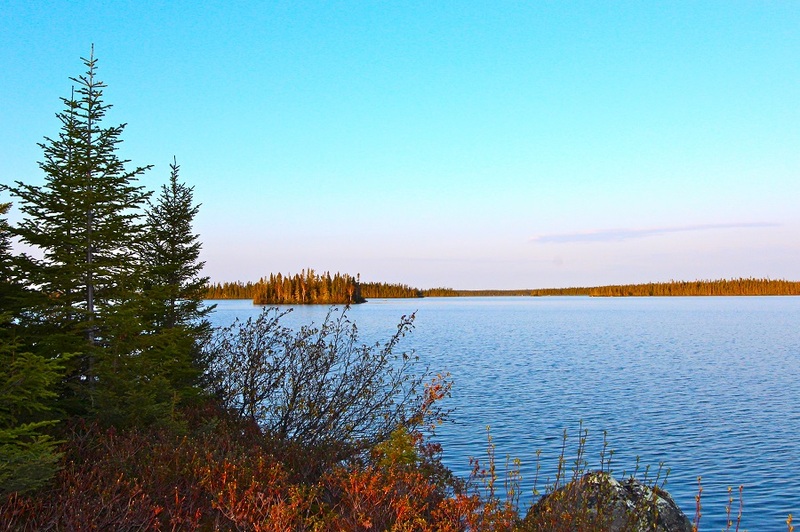 There are three distinct general areas in Labrador best known for trophy brook trout fishing. 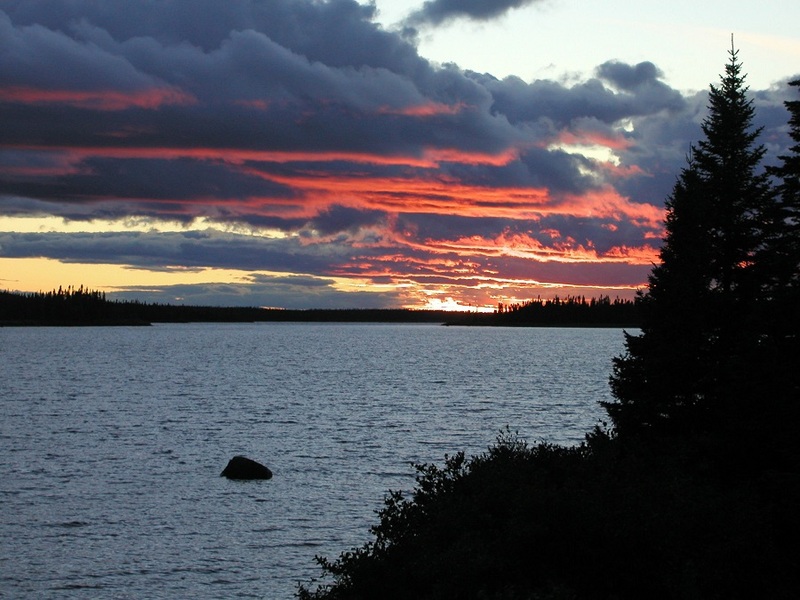 Two are the Minipi and Eagle River watershed systems in the southeast, and the other is The Mackenzie/Woods River system in the west. These differ in environment, all but offer great opportunities to catch big wild fish in their natural habitat. No stocking of any kind has ever taken place. Because of their remoteness and lack of access, along with catch-and-release policies implemented years ago by forward-thinking camp owners, fishing today is as good as it was 30 or 40 years ago. 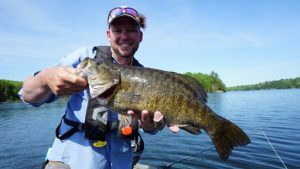 Some camp operators indicate that the average size of fish has actually increased over in recent years. Locating brook trout in lakes involves remembering what they eat on a regular basis. This includes crustaceans, frogs, and smaller fish (including their own species), as well as insects such as mayflies, caddis flies, and stoneflies. Besides determining a food source, it’s also important to locate the proper temperature, well-oxygenated water and cover. Brook trout rarely hold deeper than 35 feet, preferring to stick close to shore along abrupt drop-offs and around islands and shoals. The mouth of an incoming stream will attract them, because the water is generally cooler there with more oxygen, which, not only makes them feel more comfortable, but also attracts baitfish. Large boulders are another hotspot to try. As the summer comes to a close, brook trout will move from their normal hang-outs to spawning areas with cool water and gravel bottoms, which are generally found near stream mouths and where lakes narrow. Unlike brook trout in lakes, which tend to cruise, those in rivers tend to select a comfortable spot and stay in it or close for the whole season, preferably places close to cover where the substrate consists of gravel and cobble and where there is also a good flow. The ideal lie is where some sort of structure deflects the fast water, creating a patch of slower water next to it. This provides the trout with safe cover and shelter from the fast water, which is close enough for it to hold and make forays quickly and easily to intercept food items drifting downstream in the faster water without expending too much energy. More frequently, rather ambushing from cover, trout will hold right in the seam (the interface between the fast and slow water), which puts them even closer to their prey drifting past. The configuration of a seam varies according to the kind of structures which creates it. There are vertical seams, which run alongside and downstream of structures lying parallel to the current, such as rocks and fallen trees. These are often marked by a line of foam. Sunken ledges running across the flow, especially those where riffles run into pools, create horizontal seams where a layer of fast water runs over a layer of slower water beneath. Trout will lie on the slower water and dart upwards to grab food items drifting past in the faster water above. Seams are also found in the upper sections of pools where currents moving at different speeds meet. These are almost always marked by lines of foam. Submerged rocks also create sheltered pockets where trout will hold, with their noses up close to the downstream edge or close to its sides. For the same reason, large arbor reels with smooth drags that will hold at least 150 yards of backing are necessary. As brook trout have an annoying tendency of running directly at you, the large arbor is a great asset in picking up loose line faster. Load one reel with a standard weight forward floating line, another with an intermediate sinker, and a third with a bass or pike taper for casting the large mouse patterns. For dry fly fishing a leader tapered down to a 3x tippet is sufficient, as the fish don’t seam to be leader shy. 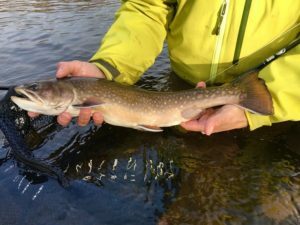 On rivers, the key to successful dry fly fishing for brook trout is to make short casts and drifts, which help in avoiding the dry fly fisher’s main enemy, drag. Having a short length of line on the water reduces the incidence of drag. 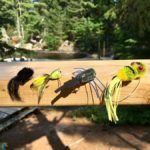 However, because the shorter length of line means that the length of the drift will be shorter, it’s essential to cast accurately to a rising fish or likely lie, so that the drift begins just upstream of its window. Because trout usually drift downstream to take flies on the surface, it’s important to cast a few feet above a rising fish in order to get a drift to where it’s holding. To avoid spooking a fish which has not risen to the fly, always wait until it’s drifted downstream of the window before picking up the line to cast again. However, there are times when the fly should be given action rather than be dead drifted, primarily when newly-hatched or oviposting caddis flies are skittering on the surface. 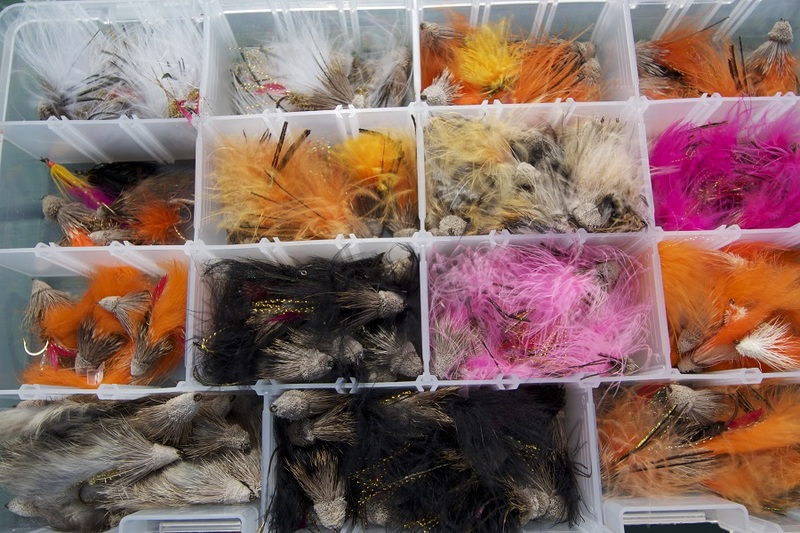 On lakes dry fly fishing can include attractor patterns along as well as matching the hatch. Attractors such as bombers can be skittered across the surface producing incredibly vicious strikes. 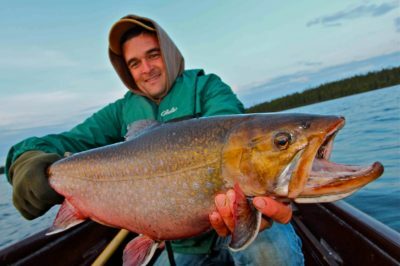 I experienced two days of this on Igloo Lake in Labrador last year, which were incredibly effective and exciting, resulting in a brook trout over seven pounds. Brook trout will also take emergers on lakes. A couple of years ago when I was fishing at Minipi Camp on lake Ann Marie, I saw what I thought was a hatch of mayflies and fish rising to them. But I was mistaken. After my floating flies were repeatedly refused, I took a closer look and discovered that the fish were taking emergers just below the surface. So I quickly changed to an emerger pattern with a tiny split shot placed about three inches ahead of it to make it sink an inch or so. Retrieving this slowly produced some of the best brook trout fishing I’ve ever experienced. Large brook trout will sometimes feed on voles, shrews, and other rodents which fall in the water and try to swim away. I have seen pictures of the stomach contents of a large brook trout which included three voles. 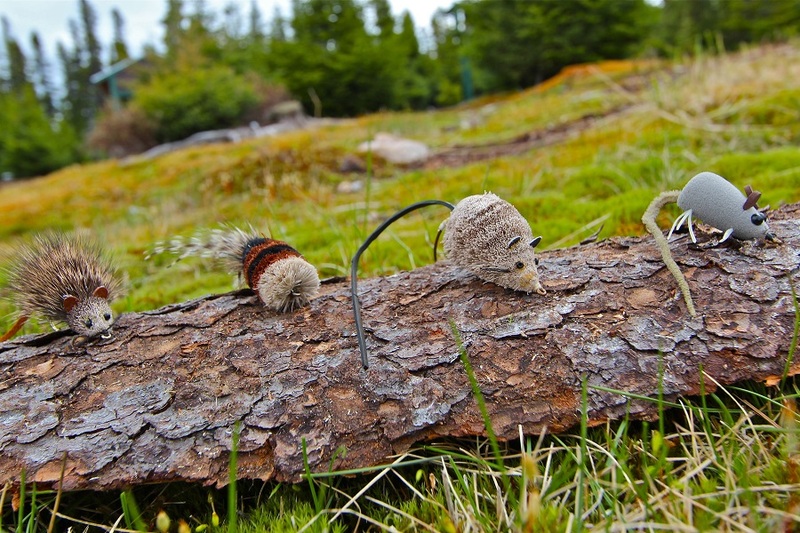 Consequently, mouse patterns can be both deadly and extremely exciting. Mouse patterns should be cast close to any structure where fish are likely to hold, and allowed the fly to sit until the disturbance created by it landing has settled. Then the line should be tightened and given a quick jerking retrieve, making the fly pop. This should first be done aggressively to see if the fish are willing to chase. If there’s no response, slow the retrieve, consisting of a series of pops and pauses. One particularly effective mouse pattern is The Shaving Brush, which moves a lot of water and makes a lot of noise. Balsa wood poppers which imitate frogs are also very productive. On lakes, nymphs and wet flies can be fished with a slow retrieval. The fly should be weighted enough to get close to the bottom. Another effective technique, especially when the wind is blowing and there’s a ripple on the surface, is to hang a nymph under an indicator and allow the ripple to move the indicator up and down, transferring the motion to the nymph, which gives the illusion of life. While most nymphing techniques will work effectively on rivers, I prefer to use an indicator placed above the fly at a distance approximately twice the depth of the water, with split shot 14 to16 inches away from the fly, using only the minimum required to get the fly close to the bottom. I cast this upstream and allow it to dead drift at the same speed as the current, lifting the line off the water and following along with the rod tip, and setting the hook at the slightest unnatural movement of the indicator. 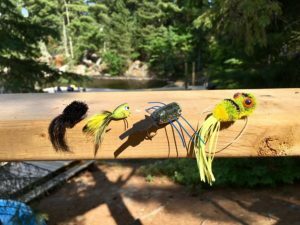 Although it’s not as much fun, streamer fishing is probably the most deadly technique you can use for large brook trout, for, although they will feed on insects, they need more substantial food items to sustain them. Consequently, they feed heavily on small fish. 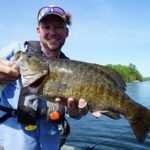 On a lake I prefer intermediate lines,as they sink slowly and maintain a constant depth longer more effectively than a sink tip or a floating line with a weighted fly. I cast out as far as I can and count down to 10 or 15 before beginning the retrieve, which allows the fly to sink to the depth I wish to fish at. Retrieves vary from very aggressive and fast to slow and jerky. Fast retrieves this will entice only the most aggressive fish, which are generally the bigger specimens. Slow retrieves should be given a side-to-side jerking motion to imitate an injured baitfish. On rivers, streamers should be cast slightly downstream and across the current, followed by an upstream mend of the line, which allows the fly to sink. The fly should be allowed to swing with the current through the most likely holding water. At the end of the swing, the fly is retrieved in a series of 10 inch strips. It’s best to start with a short line, lengthening it by about a foot after every two or three casts. Once the amount of line out has reached an optimum length, move downstream one foot at a time. This will enable you to cover all water effectively. 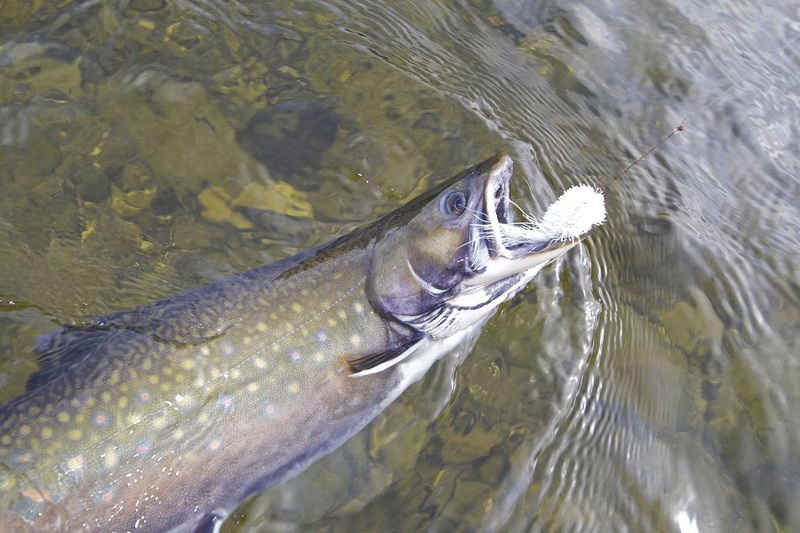 It’s the same technique used by most Atlantic salmon fly fishers to fish a run effectively. 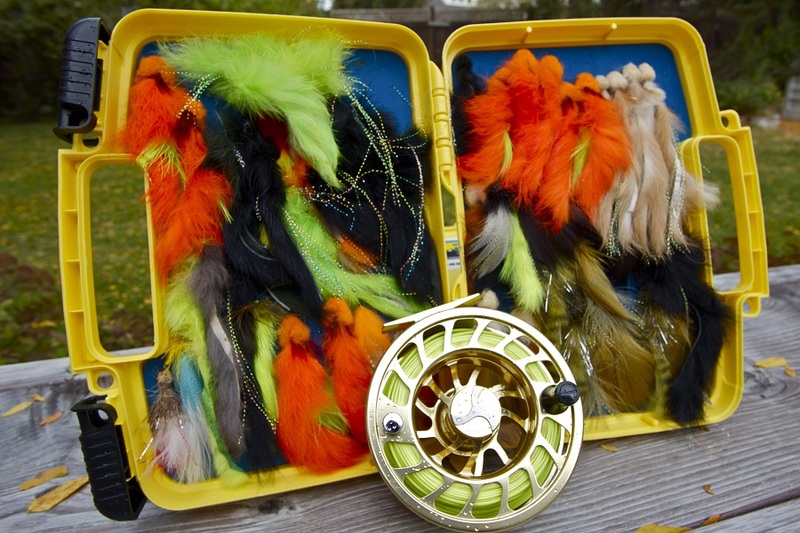 Your fly box should include a selection of minnow patterns such as Deceivers and Clousers, deer hair mouse patterns, strip leeches and other leech patterns such as Zuddlers. 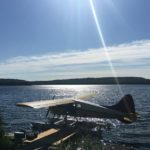 As the hatches in Labrador can be incredible, include a good selection of dry flies and nymphs, including mayfly, caddis fly, and stonefly imitations. 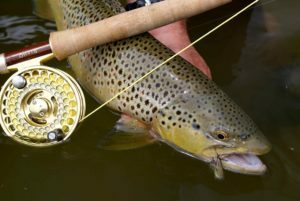 Any dry fly, or nymph you might use on your own trout stream will work. 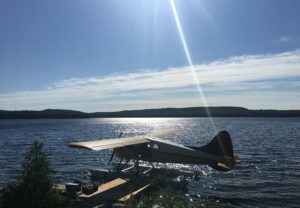 On my last trip to Labrador 70% of my fish were taken on dry flies. It pays to take along as many sizes of each dry fly as possible. 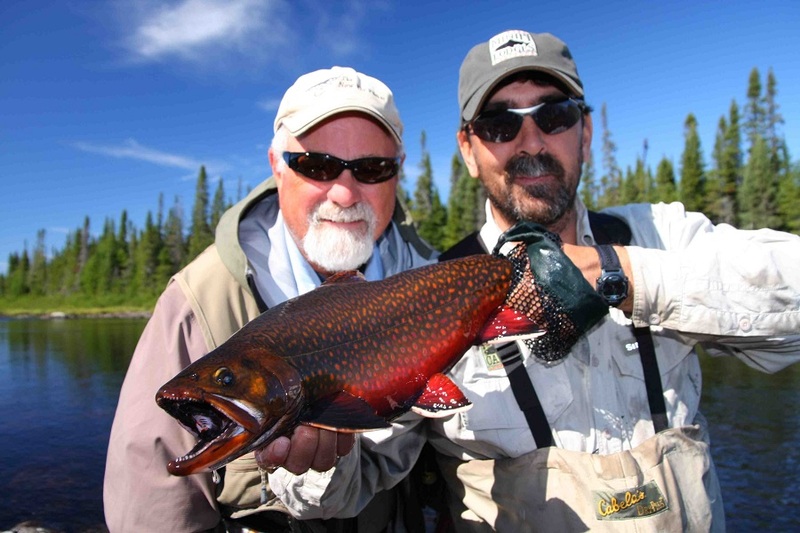 The brook trout is one of the hardest fighting and beautiful fish you will encounter, and Labrador is definitely the place to catch the giants.